Credit approval decisions encompass trade credit, consumer credit or equipment financing. 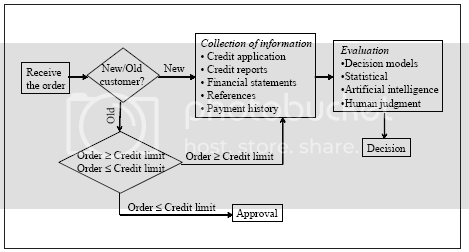 The time and expense involved in credit decisions depends on whether the customer is new or established, availability of current information, whether an order is above or below the credit limit, algorithms applied to evaluate the credit worthiness of the customer, and other factors deemed important by the credit manager. This approach has worked fairly well in established traditional commerce. However, in the new e-environment, this approach can be costly, delay credit approval and cause inconsistency in decision-making, and result in lost sales or un-collectibles. Now, incoming orders are automated, 24/7 and customers are geographically scattered. This environment forces corporations to respond to routine and non-routine credit approvals in real time. The traditional credit approval process may become a bottleneck in the revenue-generation process, since alternate suppliers are only a click away. Historically, corporations have attempted a variety of techniques to accelerate the credit approval process; for example, reengineering, automation and artificial intelligence techniques. Internet resources provide other options to manage the credit approval process. Internet-based resources and services can be used to collect information on the customer, can provide standard and customized decision mechanisms, or can be used to automate the entire credit approval process. The Internet has numerous resources to collect general information regarding new or prospective customers. The illustrative list of resources is provided in below exhibit. Note: The above lists merely give some examples, but are not meant to be an exhaustive list of either resources or services. Additionally, nature of the services provided changes rapidly. These services provide a good starting point in the credit approval process. Costs vary based on the brand name of the service, depth of the information desired and extent of the required information. However, information concerning small businesses or international businesses can be hard to obtain. The information provided is quite comprehensive and, according to vendors, updated constantly. These services are cost effective even for ad-hoc queries and accessible by a browser; search and retrieval of this information is available in real time. For example: prices can vary from $X per query to thousands of dollars for an annual contract. Information on small businesses, privately held businesses and international businesses is also available. The disadvantages of these services are difficulty in verifying accuracy and integrity of the information, continuing need for cost-benefit analysis and stability of the service. Internet-based services also provide tools to aggregate the information to derive credit rankings. Illustrative sites that provide these tools are shown in below exhibit. The risk assessment tools use proprietary algorithms but also allow customization based on criteria specified by the customer. For example: a vendor can tailor the program to a specific company’s needs, design rules and criteria based on that company’s input, offer standardized decision engines, interpret results and push the results to the credit manager’s desktop. The decision engines employ a variety of algorithms; for example, advanced statistical methods, expert systems and artificial intelligence techniques. The users need not understand technical intricacies of the program, but should have a general understanding of the strengths and weaknesses of various algorithms. The outputs of the system can include a credit risk score, comparison of risk level of the business with other businesses, background information regarding the business and other items specified by the user. These services can be tailored to small businesses, international businesses or large businesses. The primary advantages of these decision tools are: minimized manual intervention, reduced cycle time for decisions, consistency in credit policy enforcement and reduced operating costs. However, the tool needs to be chosen carefully, and there are upfront and recurring costs, such as software and hardware investment, programming and validating the tool, continuing maintenance or monthly payments to Web-based services. The traditional, off-line credit grantors will benefit from the resources listed so far. However, in the case of Web orders, the credit decision must be delivered in minutes or seconds. This calls for automation of the entire credit approval process. The credit approval decision can be completed in a matter of minutes. Web-based services that provide such support are listed in blow exhibit. Business installs the automated credit decision-making system. The system needs to be integrated with a legacy accounting or ERP system, connected with approved credit bureaus, able to access designated public information sources and be embedded with the required decision expertise. Customer information is forwarded to the credit system once the sales order arrives. The credit system pools data from the accounting system, credit bureaus and public information sources. The collected information is filtered through the decision engine to arrive at a credit score and the consequent decision. The decision engine is provided by the vendor and is generally customized by the business. If the decision is yes, then the system can generate the necessary documentation or can forward the decision to the approved personnel or machine. Exceptions are handled on basis of the rules programmed in the system. The costs and successes of such services are based on a variety of factors; for example, transaction volume; difficulty in integrating a credit system with accounting systems; types and number of credit bureaus used; and intangible costs, such as process redesign or reengineering, and resistance from the credit personnel, among other things. The speed with which credit needs to be approved. The frequency of routine vs. non-routine (such as exceptions, high-dollar value items or risky customers) credit approval decisions. The higher the frequency of non-routine decisions, the lesser the use of the credit approval system. Accuracy and integrity of the information available on the vendor’s Web site. The decision tool should be evaluated for accuracy, customization capabilities, expertise and training required for using the tool, updating routines and data import/export capabilities. Ability of the automated service to integrate with existing legacy or ERP systems. Relative costs involved in in-house vs. outsourced credit approval decision. For example, costs saved — such as redeployment of credit personnel, no investment in software and hardware, no recurring maintenance expense; against costs incurred — such as lost expertise, treatment of exceptional cases, monthly payments, cost of dedicated connections and stability of the service provider. The Internet has opened new ways to approach credit approvals. The Internet-based resources can speed up the credit approval process and support various degrees of automation. Various levels of services are offered by such Internet-based companies. 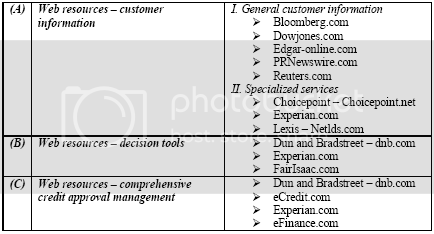 Acquiring information about the customers from proprietary and public databases, feeding customer information into decision tools available on the Web or customizing the entire credit approval process; whatever the requirement, the Internet can be profitably leveraged to improve the credit approval process.